PRESS CONFERENCE: In April 2014, Joseph Boutilier embarked on a 5,000-kilometer, 5-month unicycle ride across Canada to promote unity for the climate. The trip culminated in Ottawa after rallies, events and meetings in dozens of other communities along the route. Joseph is just two days away from completing his 5,000km unicycle ride for climate action! Thanks to your enthusiastic help and support, Joseph has made it through five Canadian provinces and three US states and is now less than two days away from his final destination: Parliament Hill. But, as he notes, the ride is “the easy part.” While in Ottawa, Joseph hopes to get real commitments from elected leaders across the political spectrum to raise the priority of addressing climate change. To do this effectively, he needs you to add your voice the debate. 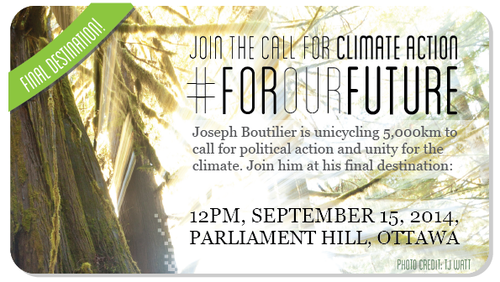 If you’re in Ottawa, please join Joseph and others at his arrival on Parliament Hill this Monday (September 15) at 12pm. If you have friends or family in the capital, please encourage them to attend this important event. Lots of things have happened since Joseph left Victoria on April 5. Some are terrifying and others are very hopeful. A leaked draft of the next UN IPCC report warns of runaway warming, strangled food production, devastating heat waves and unprecedented floods that could drown thousands of coastal communities. And another report revealed that C02 emissions increased at a faster rate in 2013 than any other year in the past three decades. On the other hand, Obama introduced an ambitious new carbon-reduction strategy and China has pledged to introduce a powerful emissions-scrubbing carbon market in 2016. This is amazing news and puts even more pressure on Canada to act. The ride might end on Monday, but the journey is just beginning. On September 21, Joseph will bus down to New York along with hundreds of other Canadians to join the largest protest in the history of the climate movement. On September 28, he’ll be back in Ottawa for ClimateFast; a four-day fast and series of events to call for climate justice and action. With your help, September could well be the month that Canada finally begins to take global warming seriously. If you can’t make it to Ottawa, there’s still lots you can do. Send a letter to your local MP to tell them about Joseph’s ride and encourage them to take action. See if they’ve signed the ClimateFast pledge and if not, ask them to take this simple step to demonstrate their commitment to the cause. If they’re in an opposition caucus, forward them Joseph’s open letter to opposition party leaders. Share news of Joseph’s journey on Facebook or Twitter and help bolster the demonstration of willpower for climate action. Check out the in-kind donors and sponsors on the bottom of the official homepage and thank them for their contributions. Three prominent MPs have agreed to meet with Joseph after the noon rally to demonstrate their support: NDP Environment Critic Megan Leslie, Liberal Environment Critic John McKay and Green Party Leader Elizabeth May. Why not sending them a note to thank them for their actions? Environment Minister Leona Aglukkaq has not yet responded to Joseph’s requests for a meeting. 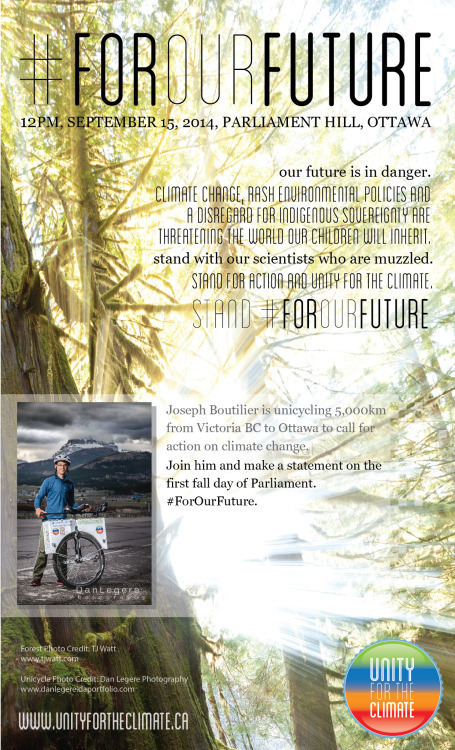 Join Joseph in calling for answers on past promises to address global warming by contacting The Honourable Minister. Joseph has outlined these concerns inan editorial in The Hill Times. Last but not least, there’s still time to join the People’s Climate March in New York! Some 400 busses and trains are headed to the event, including many from Canadian cities. Prime Minister Stephen Harper and Environment Minister Leona Aglukkaq will be at the UN summit, and the march through the city will demonstrate a powerful consensus across North America for all nations to take urgent steps to reduce emissions. For more information on Joseph’s journey and his aims on Parliament Hill, don’t forget to check out the website, or read this recent interview with the Alternatives Journal. Thanks to your interest, support, donations and assistance, Joseph will soon be able to stand up in front of Parliament Hill to call for a sustainable future. And thanks to you, we’re already building unity for the climate. Dear Opposition Leaders: What Will You Do #ForOurFuture? NOTE: This is a companion piece to an open letter to Prime Minister Stephen Harper and Environment Minister Leona Aglukkaq. An iteration of that letter, in editorial format, can be found in The Hill Times. What would you do if you knew an international crisis threatened to rock the very foundations of our civilization within the next century? If you could act to stop the eradication of thousands of coastal communities, the rapid spread of communicable disease, the threat of economic collapse, famine and war before it even happened, would you? With every day of inaction on climate change, the probability of these and other risks increases dramatically. No one person, party or nation, alone, can stop climate change, but you all have a special opportunity as party leaders to forge a new path towards key political action. On April 5 I set out from my hometown of Victoria to unicycle 5000km to Ottawa, to call for political action on climate change. I plan to arrive for the opening session of Parliament on September 15. I have issued an open letter to Prime Minister Stephen Harper and Environment Minister Leona Aaglukkaq and hope to meet with Ms. Aglukkaq after I arrive in Ottawa. However, I recognize that our government encompasses hundreds of MPs from several distinct parties and that every Member of Parliament has a vital role to play in promoting and demonstrating leadership for climate action. Furthermore, with the 2015 federal election rapidly approaching, the potential for a major political shift may present an opportunity for Canada to restore its reputation as an environmental leader and truly reflect the will of the population for rapid, strategic climate action. In order to ensure this outcome, we must all be vigilant in adhering to key targets suggested by the scientific community, and in embracing a cohesive vision for Canada’s energy future. We are at a critical juncture, a crossroads between two paths: one leading to sustainability, the other to environmental and economic collapse. As a record number of new proposed oil and gas extraction and transportation projects are nearing development, we are perpetuating long-term investments in short-term opportunities, and contributing to a status-quo that, left unchecked, will trigger a devastating 6-degrees of warming (or more) by the end of this century. Canadians need to know in advance of the next election how their votes could affect our government’s reckless course of inaction. Consequently, I am encouraging all party leaders to provide clarity on their climate-action proposals, reinstate their commitments to critical climate policies, and demonstrate a willingness to work across party lines to address the biggest global crisis of our time. I invite any opportunity to meet with you in person, on or after my arrival in Ottawa. I also invite any public responses to the following questions in advance of my arrival. In interacting with hundreds of ordinary Canadians across western and central Canada, I have come to realize how many of my concerns are shared by a broad range of individuals across every imaginable demographic. I have endeavored to focus exclusively on these shared concerns. While I represent only myself, I’m confident that my deep concern for our lack of action on climate change is shared by the majority of Canadians, and that this will be reflected in the lead-up to the 2015 election. Thomas Mulcair: I commend you and your party for maintaining a prominent and comprehensive environmental strategy in the NDP’s policy book, and for advocating continually for more direct federal action to mitigate Canada’s significant global impacts on climate change. Your recent attempts to revive the Climate Change Accountability Act calling for greenhouse gas reductions of 80% below 1990 levels by 2050 – as well as your opposition to the Northern Gateway Pipeline, your condemnation of government subsidies for the oil and gas industry, and your stern assertion that Canada must stand by internationally-binding emissions targets – demonstrates a legitimate understanding of the profound concerns of Canadians on this issue. Your proposal of a federal cap and trade program suggests that you recognize the need for further measures to significantly reduce our emissions and foster new economic opportunities and a smooth transition to renewable energy solutions. As you know, cap and trade systems are widely recognized as a legitimate strategy for spurring C02 reductions, but they have also been prone to significant problems in other countries, which have stifled the intended impacts. Lack of regulation, overly-charitable trading terms and corruption has lead to cap and trade systems in the EU and elsewhere to fall dramatically short of their targets; in 2013, the United Nations Environment Program warned that this climate control mechanism is inherently more prone to corruption than other types of emission-reduction programs. Canadians need to know that you have seriously considered these challenges and have a plan to verify that a national Canadian cap and trade system would quickly and effectively reduce emissions. Similarly, many Canadians, myself included, are concerned by your endorsement of the Kinder Morgan and Energy East Pipelines; we recognize that these projects are significant economic investments and fear they may be incompatible with restrictions on oil sands expansion that are important for meeting targets such as the one proposed in the Climate Change Accountability Act. Environmentally-concerned Canadians want your assurances that you have a long-term energy plan for Canada that includes new regulations on the oil sands. Canadians also want assurances that the broken National Energy Board and Joint Review Panel processes for approving pipelines – which have failed to ensure the protection of the health, safety and livelihoods of communities in the vicinity of projects like the Northern Gateway Pipeline – would be revised under your leadership. What are the details of your cap and trade proposal, new industry regulations and subsidy cuts, and what revisions would you make, if any, to new development review processes? Justin Trudeau: Canadians are greatly encouraged by your promise to price carbon, and are eager for more details to ensure your party has a concrete plan that can help us meet or exceed carbon reduction targets. Your obvious sympathy for the public’s concerns around direct environmental and long-term climate impacts of the Northern Gateway and Energy East (Line 9) pipelines is also hopeful. You have expressed dissatisfaction with the NEB approval process, and are clearly committed to introducing more balanced consideration for oil and gas projects versus renewable energy alternatives. You support the Keystone XL pipeline. I fear that by suggesting this project has failed to gain public endorsement and American approval due to poor consultation, you are overlooking the significant climate impacts of the project, which would enable rapid growth of the oil sands to an extent that may be incompatible with critical thresholds of global warming. Similar concerns exist about your support of the Kinder Morgan pipeline. What would a Liberal government do under your leadership to mitigate these devastating impacts? What emission-reduction targets do you support, and how would you get Canada back on track for its Copenhagen commitments? What new regulations for the oil sands, if any, would you table to promote the sustainability of our economy and environment? Would a Liberal government eliminate the annual tax breaks that Canada currently grants the oil and gas sector, and reprioritize incentives to foster renewable energy growth? I challenge you to answer these important questions to solidify your commitment to ensuring that our future generations can look forward to a sustainable economy and livable, protected environment. Mario Beaulieu: Congratulations on your recent election to leader of the Bloc Quebecois. Your party has repeatedly called for a focused, credible greenhouse gas reduction plan, plus an adaptation program to deal with the reality of increasing climate impacts on our public infrastructure. It’s clear that your party acknowledges the reality of global warming and the need for stronger mitigation policies. Your personal thoughts on climate change are not well known, but advocates for climate action are hoping your recent promotion to Party Leader will shed some new light on the party’s specific climate policies. Do you support a price on carbon, or do you see Quebec’s provincial cap and trade program as a model for a possible federal initiative? What GHG emission reduction targets would you support, and what would you consider an ideal outcome for Canada’s participation in the upcoming UN Climate Change summit in NYC and the COP in Lima, Peru in December? Elizabeth May: Your party has continually encouraged commendable, bi-partisan action on mitigation of Canada’s climate change impacts through a range of policies. You also support a fee and dividend program to help Canada reach its current C02e reduction targets. However, it’s not clear if any of the larger parties are also considering this approach; accordingly, would your party work across party lines to support other carbon-reduction policies? Although you hope to expand the presence of Green MPs in parliament, you don’t anticipate your party will form government. In an election that will likely cast a fragile balance of power between other parties, how would more Green MPs bolster Canada’s cohesiveness and capacity as it relates to climate action? As party leaders, Canadians expect the utmost in leadership from each of you on this issue. People of my generation fear we are inheriting a country that is woefully unprepared for the challenges of the future while causing irreversible environmental damage and global injustice. We are eager for change, and recognize the 2015 election as a chance to revitalize our government and its priorities. But we fear that without important answers, specific strategies, policies and commitments around climate change mitigation, this chance could be wasted. Leaving voters uncertain of the impact of their ballots will further damage the public’s faith in our parliamentary democracy and contribute to even lower voter turnout. But it will also perpetuate the biggest frustration with our political system: the government’s lack of ability to work together to address urgent issues such as climate change. My last question is for all of you and, indeed, all Members of Parliament: If elected, how will you work with members of other parties to address the climate crisis? Would you be willing to vote across party lines in order to support GHG-emission reduction policies from other parties? Canadians understand that it is imperative that we find unity across party lines if we are to successfully avert the pending climate crisis. Just as we need political unity in Canada, we must find unity with our global neighbours. This is recognized by groups such as ClimateFast. This group of dedicated advocates refrains from eating for several days each year to call for critical action on climate change. I will be joining ClimateFast for their annual five day fast, which begins on September 28 on Parliament Hill. I encourage you all, as Elizabeth May and individual NDP and Liberal MPs have already done, to show your support by signing their pledge for climate action at http://climatefast.ca/pledge-support-fast-politician. I look forward to being enlightened on the important details of your unique climate policies in advance of my arrival in Ottawa, or during meetings after my arrival on September 15. We must work together in good faith, with expediency and conviction, for our future. We must replace vague promises with clear commitments and a vision for cooperative action. We must embrace unity for the climate. Thank you deeply for your leadership, your concern and your consideration. Join the call for unity and action across partisan lines to address climate change and climate injustice! 12pm, September 15 on Parliament Hill in Ottawa. Canadians and Americans must unite in the name of climate justice and political action. 08/30/2014 - Joseph Boutilier chats with Nneka and Jee about his cross-country unicycle ride to raise awareness about climate change. I’m riding a unicycle 5,000km from Victoria BC to Ottawa. My goal is to raise attention to the shameful state of Canadian inaction on climate change.